The ACLA is pleased to award the Harry Levin Prize in Comparative Literature for 1985 to Virgil Nemoianu. 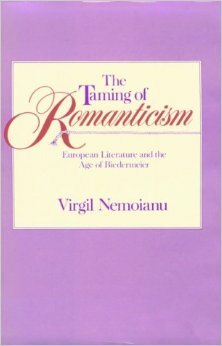 His The Taming of Romanticism (Harvard University Press, 1984) presents a new intellectual framework for understanding European literature of the period 1815-1848, and the originality of his historical and critical formulations is matched by the broad sweep of the many European literatures from which he draws his examples for analysis. A truly comparative study, The Taming of Romanticism, while suggesting some answers, also proposes new questinos pertinent to the history of 19th century literature and literary periodization as a whole.